Return is calculated using combined bill savings and subsidy earnings. Bill savings are calculated using estimated energy usage and either the electricity price at the time of installation (10 November, 2013) or, for our heating products, the existing fuel type available to the property. This high electricity user was keen to find ways to reduce his bills. 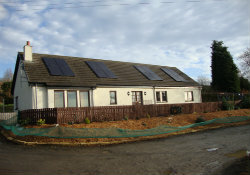 As the property is largely in use during the day, making the most of solar energy was an obvious option. The client approached EnergyMyWay looking for savings but was also keen to maintain the aesthetics of an attractive, detached property. The home owner has planning approval to extend into the attic so we worked with them to ensure that the panels were positioned to avoid future plans for velux windows. A 4kW system was installed, and good quality black German modules were chosen to give a low profile and blend in with the existing roof covering. Due to the distance positioning of the modules a dual input inverter was chosen to minimise any shading affect from surrounding obstacles.